If you would like Judge Hogan to speak at your event, please contact us with the details. Topic: "Resolving the Complex Construction Case: Mediator and Advocate Perspectives"
Topic: "Newsgathering: Singing a New Tune in the Shadow of National Security Agency Surveillance"
"Former NSA Contractor Edward Snowden's revelations - about "covert, clandestine, and cooperative large accesses" of private information seized by the NSA - have sparked an ongoing public debate about the proper balance between civil liberties, privacy, and security. Snowden's "whistle-blowing"/leaking drew accolades and criticism, his prosecution and asylum, shock and lawsuits by Americans, new surveillance guidelines from the Obama administration, political ramifications worldwide, controversy about big technology and private data storage in the Cloud, and more. Counsel for media organizations confront an ever-changing legal and technological landscape that affects how their clients gather news and the means by which they conduct their own digital and electronic communications. The panel will explore these, among other, thorny legal issues." Nicole Wong - The White House, Washington D.C.
Topic: "What Do Judges Want in Order to Grant Your Motions?" "Experienced judges will reveal what they want and don't want in presentation of Rule 104 motions, discovery motions, summary judgment motions and motions in limine and jury instructions. Ideas on how to win your motion will also be discussed." Topic: "Alternative Dispute Resolution - The Judge's View"
Topic: "Newsgathering: Covering Ground Zero Tragedies"
"Aurora and Sandy Hook are just two of the recent tragic incidents that highlight the journalistic challenge of getting a full, accurate story out to the world, without breaching common decency, journalistic ethics, or legalities. This panel will explore the many issues that ensnare newsgathering and coverage of today's mass tragedies and the high profile criminal trials that follow, from real-time crowd-sourced news verification errors, to access to 911 calls, grand jury transcripts and other criminal justice records, to liability for republishing links and other online content, and more." Topic: "Helping Parties Find Resolution: The Effect of Role and Voice in Mediation"
"In this moderated discussion, two former federal judges turned mediators will discuss how their views on mediation have evolved as they have transitioned from the judiciary to private practice. Topics explored will include how to set the tone for a mediation, how to decide how directive or facilitative to be and where they look to the lawyers in the case for help. Audience questions and participation will be encouraged. " Topic: "Timing is Everything (Especially in Mediation)"
"This presentation will explore various aspects of timing in mediation, with a particular focus on timing relative to negotiation and litigation strategy. For instance, should mediation occur before or after a ruling on summary judgment? When should the “smoking gun” be produced? How much time should be devoted to the mediation effort? Using actual and hypothetical case scenarios, the presenters will involve the audience in a discussion about timing from the perspective of the mediator, counsel and parties involved in mediation of their dispute. " 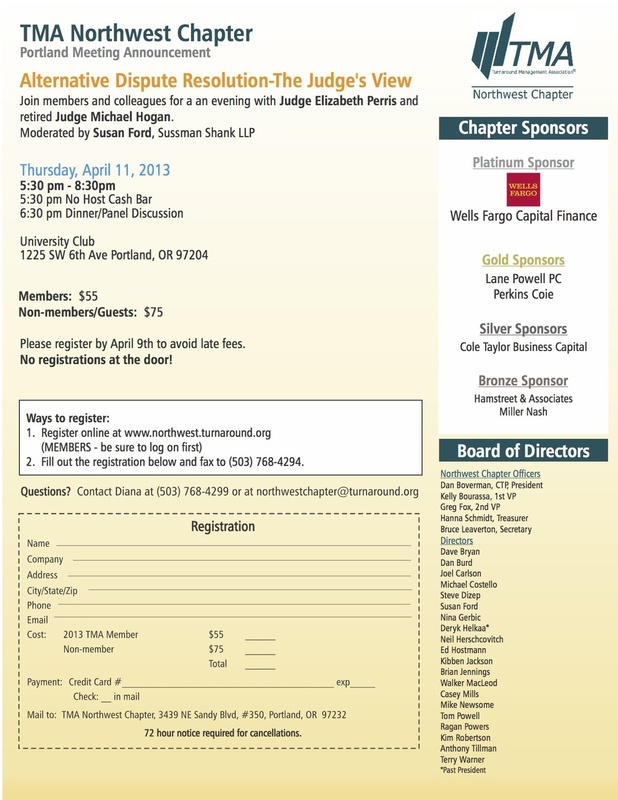 Topic: "Federal Trials and Mediation in Southern Oregon: A 40-Year Perspective"